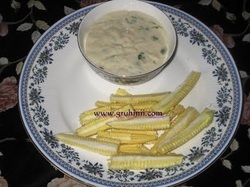 Cut the baby corns lengthwise as shown in the picture and keep them aside. 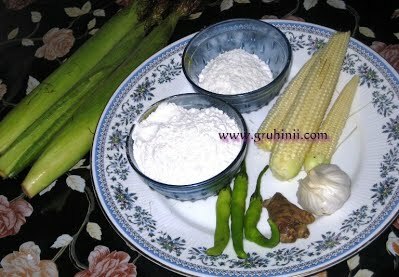 Make a smooth batter of Maida and corn flour adding salt, chilli paste, ginger garlic paste and coriander leaves adding sufficient water. Heat Oil in a pan for deep fry. Dip the baby corn pieces in the batter and drop slowly in the oil. Fry in a medium flame until golden brown, drain on an absorbent paper and serve hot with tomato sauce. 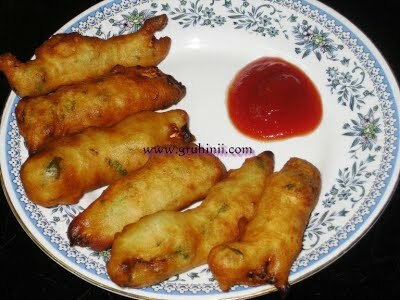 Baby corn Pakoras are ready. Enjoy ! !